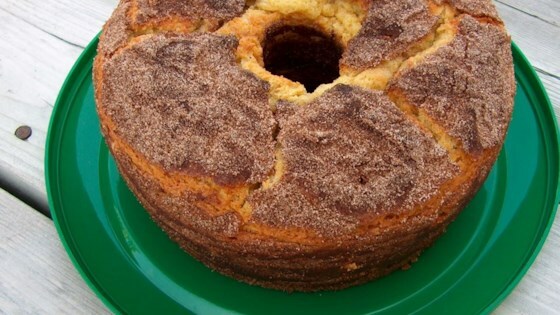 "Fantastic moist bundt cake infused with sherry wine." Preheat oven to 350 degrees F (175 degrees C). Oil the sides and bottom of a 10 inch Bundt cake pan. In a small bowl, mix cinnamon, sugar and cocoa. "Flour" the sides and bottom of the pan with the mixture, tap out the excess back into the cinnamon mixture. In a large bowl, combine the cake mix, eggs, oil, sherry, nutmeg and pudding mix. Beat until well blended. Pour half of the batter into the Bundt pan, sprinkle with half of the cinnamon sugar, cover with the remaining batter and finally, top with remaining cinnamon mixture. Bake at 350 degrees F (175 degrees C) for 45 minutes, or until toothpick inserted into cake comes out clean. Cool in pan for 10 minutes, then turn out onto a wire rack. I made this exactly by the recipe. It was only ok. It was very moist, but we thought it had a bit of a sour aftertaste. I will not make it again. This was a simple and deliciuos recipe! I added a layer of Apple Pie Filling in the center between the cinnamon mixture. I will definitely make this for parties and summer get- togethers. Thanks! This was great! I didn't have any nutmeg so I used an extra tablespoon of cinnamon. I also left out the cocoa and added 1c of pecans. Loved it!